HomeSeer Unveils HSM200 Z-Wave Multisensor - Night Light - Indicator Module! 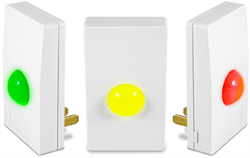 HomeSeer unveils its line-powered HSM200 Z-Wave multisensor - night light - indicator module. The unit senses motion, temperature and light level, can function as a night light, and can also be programmed to display up to 7 different glowing colors when things happen in the home! HSM200 is slated to begin shipping in October and will retail for $69.95. Dealer inquiries are welcome. For more information, visit HomeSeer at CEDIA Expo 2014 (Z-Wave Alliance booth #522) or contact the company directly at 603-471-2816. Dealer inquiries are welcome. HomeSeer Technologies, LLC is a leading provider of home control systems based in Bedford, New Hampshire. Its software and hardware controllers give users the ability to integrate and automate everything in their homes, including lights, appliances, thermostats, door locks, security systems, audio/video, and media content. HomeSeer systems are IP enabled, allowing users remote access from anywhere in the world. Visit http://www.homeseer.com for more information.